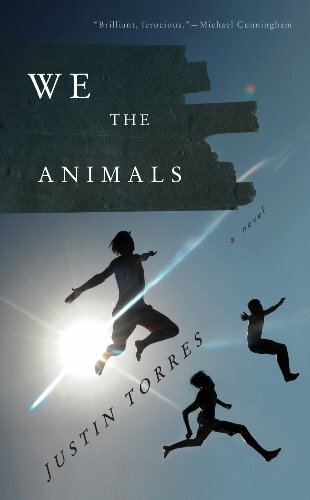 Random And Some: "We were the magic of God"
I found out about We The Animals (2011) by American author Justin Torres via BuzzFeed's 53 Books That Will Definitely Make You Cry listicle. I ordered the book from the description alone, although it helped that the list contained other books I enjoyed, such as The Perks of Being a Wallflower, The Book Thief, This Is How You Lose Her, Eleanor & Park, Of Mice And Men and The Fault in Our Stars, and others I plan on enjoying in the near future, such as We Were Liars, Sarah's Key and The Ghost Writer. Since #25 was accompanied by a description that contained "poetic", "brothers" and "coming of age", I knew that I had to check it out. We The Animals tells the story of Manny, Joel and the protagonist/narrator, three Brooklyn brothers of white and Puerto Rican parentage who live a rough childhood. With Paps being abusive to Ma, Ma barely being there for her little hooligans and the family in general living on the economic and social periphery, Torres in 19 chapters/short stories paints a harsh, raw, powerful, uplifting, depressing and brillaint picture of chaos and heartbreak, and how deeply we are formed by our earliest bonds. Through glimpses of events in the life of this concrete jungle family, We The Animals suddenly shifts from one coming of age story to another. Well, that was a quick read. Partly because the chapters were so concentrated and frantic, partly because We The Animals counts only 125 pages. I really liked the dynamic between te the brothers and that the dysfunctional family in the book loved each other through all the chaos, but other than that, I'm not very satisfied with how Torres decided to put it all together, with a lot of unexplored roads and an out-of-place ending even frustrating me quite a bit. The prose, I admit, is lovely, but throughout I couldn't help but think that Torres wasted a lot of potential here.